The Teeter FreeStep is recumbent cross trainer which can be compared in terms of frame features to the Inspire Fitness CS3 Cardio Strider. However, it doesn’t have the programmable console but does offer a durable construction, similar to a light-commercial trainer. It’s definitely a machine designed for comfort and light to medium intensity workouts, focusing on eliminating as much impact on your articulations and spinal column as possible. The Teeter FreeStep trainer features a heavy-duty frame made of steel tubing, designed to support users up to 300 lbs (136 kg). However, its construction integrates several ABS parts. For example, the covers of the drive system, the pedals and several other small covers are non-metallic. But nonetheless, the machine provides a durability and overall sturdiness which can be compared to those of a light-commercial machine. Most of the steel parts in the machine’s construction are double coated with a rust-resistant paint finish. The adjustable sections of the moving arms, as well as the seat adjustment post, feature a chrome finish. 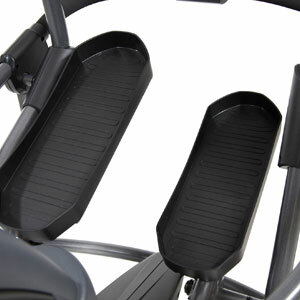 The FreeStep cross trainer doesn’t have an extremely large footprint but does take approx. 54″L x 38″W (137 x 97 cm) of floor space. On top of it, the manufacturer recommends assigning a usage area of at least two feet all around the unit, for ease of access and unhindered operation. The unit is fairly heavy. With the frame completely assembled, it weighs approx. 110 lbs (50 kg). It also has a low center of gravity, most of its weight being placed under the user, which leads to a superior stability. Plus, the rear base bar is equipped with adjustable stabilizers which have large rubber pads. Despite its weight, the unit is not too difficult to relocate, once it was assembled. Its rear base is also equipped with transport wheels. Last but not least, the casing of the drive system is molded at the front, featuring a gravity-type bottle holder. This support can accommodate most hydration bottle with no problem. 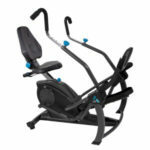 The Teeter FreeStep cross trainer features a seat designed for comfort. It does not have air-cell cushioning, but both the seat and the backrest have a contoured layer of high-density foam padding. The bottom part is approx. 14″ (35 cm) wide providing plenty of contact surface, while the backrest has a concave contouring, in order to cradle your back perfectly during exercising on the cross trainer. The seat post offers multiple adjustment positions. It is set at an angle, so its adjustments can accommodate taller persons better. This cardio trainer is designed to accommodate users between 4’11” and 6’6″ (149 – 198 cm). Also, in case you’re wondering, the seat is at approx. 27″ (68.5 cm) above floor level when it is set at its lowest position. 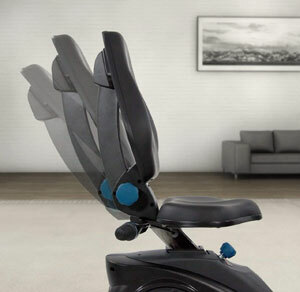 One of the pluses of this trainer is the adjustability of the backrest. Many recumbent bikes or other cross trainers do not have this feature. 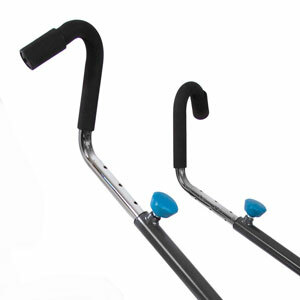 The backrest of the FreeStep offers three reclining positions. Its adjustment mechanism provides a durable lock, though, so that the backrest delivers a firm and healthy lumbar support. The machine is equipped with two sets of handlebars, one mobile, one fixed. The mobile handlebars are directly attached to the pedal bars. This being said, they continue to move for as long as you pedal, or the pedals continue to move for as long as you move the arms. They cannot move independently from the pedals. They feature curved grips with a thick layer of rubber foam for maximum comfort. The moving arms offer double adjustability. First of all, they’re lenght-adjustable, each one offering three adjustment positions. And second of all, you can lock them in an outward setting or in an inward setting. Therefore, you can diversify your workouts and focus different muscle groups. The fixed handlebars are attached to the seat. They are placed behind it, and have small grips. The right grip actually integrates the resistance adjustment dial. 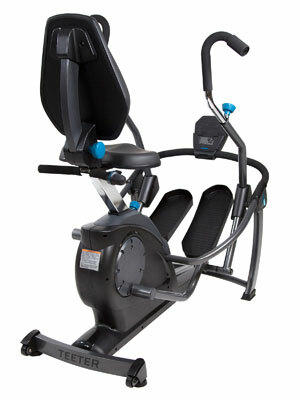 The Teeter FreeStep recumbent cross trainer integrates a magnetic resistance system with manual action. This means it does not have an internal motor for resistance adjustment, the unit does not need to be connected to a power source, and the console does not play any role in its resistance adjustment. 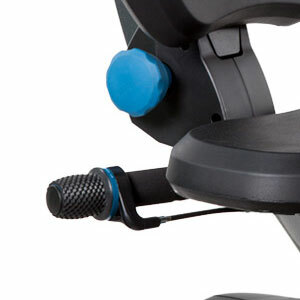 The machine’s resistance system consists of a magnetic brake which is connected to the tension knob incorporated into the right grip of the seat. As you turn this knob, the magnetic brake moves closer or farther from the flywheel, this way increasing or decreasing the overall pedaling difficulty. The resistance settings are not marked on the knob, but there are 8 distinct levels. The maximum resistance output isn’t extreme, though. The FreeStep trainer is a machine made for light or mid-range level cardio training, focusing more on comfort than on the resistance output. But nonetheless, you can still benefit from an excellent cardio workout, maintain a healthy cardiovascular shape, and even shed some pounds. The first aspect that we’re going to focus on here regards the pedals and the pedaling motion. The Teeter FreeStep cross trainer is equipped with a set of extra large pedals made of durable ABS material. They have a ribbed surface to reduce foot slippage, and a tray-like design with borders to prevent your feet from sliding off sideways. They do not have any extra cushioning, but the pedaling motion generates very little impact anyway. As opposed to elliptical trainers, the pedaling motion does not describe an ellipse. It’s more similar to the motion produced by a stepper machine, but with a backward tilt, and of course, with the comfort or being seated. Also, the stride is approx. 13″ (33 cm), offering a satisfying range of motion for most users. The weight of the internal flywheel is not specified, but considering the weight of the machine, its weight should be between 15 and 25 lbs (7-11 kg). It’s designed to deliver a steady motion and a consistent momentum. It allows a reverse motion as well, but since the pedals don’t have straps and their design setup basically requires you to press on them, reverse pedaling is rather awkward. 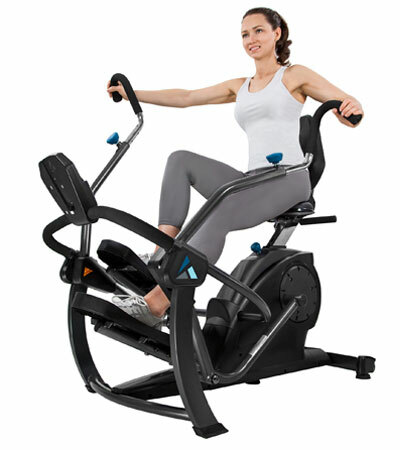 Like most recumbent exercise bikes or elliptical trainers with a magnetic resistance system, the internal drive system uses a poly-v belt. Due to this fact, the drive train does not need any lubrication. Also, the usage of the machine is whisper-quiet. The machine’s “console” is actually a basic fitness meter. As we’ve mentioned above, it does not offer any preset programs, does not have Bluetooth, sound system or other fancy features, and is not compatible with any online fitness apps. 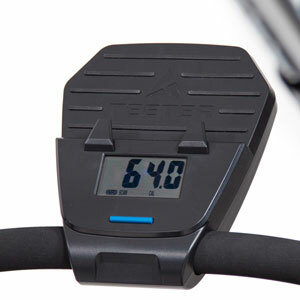 However, it does offer the possibility to track your time, distance traveled, your current pedaling speed and the calories burned. The console unit uses imperial units for the display of speed and distance. In other words, these workout metrics are shown only in MPH and miles. It does not offer the possibility to select metric units (km/h and km). It also does not have a pulse reading function. Therefore, if you need to track your pulse during your workout, you will have to use a separate device. The console is very easy to use. It uses two AA (1.5 V) batteries which are included. It only has one button which covers all of its functions. It starts up when you begin pedaling, and will automatically turn off if it doesn’t detect any activity on the bike for a few minutes. By pressing the button repeatedly, you can select any of the aforementioned metrics (time, distance, speed, calories) to appear on the display, or you can select the Scan Mode, which automatically rotates all the metrics. Also, by pressing and holding the button, you can reset all the values to zero. The top section of the console features a small shelf that can serve as a tablet holder or phone holder. However, it does not have any USB ports to connect your device to it. The machine’s internal mechanisms are already assembled. Also, most of the frame parts are pre-assembled as well. Therefore, you only have to attach the rear base stabilizer, the pedals, the seat, the backrest, the front bar that serves as support for the console, and the moving handlebars. This may take more than an hour, however, the whole task isn’t too complicated. The manual provides step-by-step assembly instructions and well-drawn schematics, and all the tools needed for it are included. Maintenance doesn’t require much. The internal mechanism doesn’t need any lubrication. Basically, all you need to do for maintenance is remove any sweat that may fall on the frame after your workout, and periodically check for loose bolts and parts. The Teeter FreeStep is a recumbent cross trainer featuring a manual magnetic resistance system and a sturdy frame. It offers superior micro-adjustability; the seat post has several adjustment positions, the backrest reclines, and the moving arms are also adjustable. The machine is designed to provide maximum comfort and a minimum workout impact for your joints and back, which makes it a great choice for recovery training or elderly users. It’s great for a low-impact, full-body cardio workout, muscle toning, stamina development, and weight loss.